Click onto image to enlarge. Let me know your response to this photomontage. Prints are available upon request. They’re gloriously magical symbols of nature’s potential. As important they’ve become strongly significant signposts for the health of our planet. Monarch butterflies are not just magnificent creatures of colorful flight and fancy, but their continual loss as a visual natural wonder has become scary and troublesome. As many gardeners and nature devotees I plant butterfly milkweed, the single most essential plant for the monarch’s survival. This past summer I was cheered by the discovery of a few more monarchs in my gardens (the count increasing since 2017) and on nature walks. But that’s a teeny tiny number. These icons of nature are desperately trying to survive in an environment dictated very much by human intervention coupled with the warming of the earth and climate change. In the Lens section is my visual ode to these magnificent symbols that represent a future with diversity of species and landscapes. The image becomes a visualization of their receding presence. I created it in black and white to avoid the distraction of their sparkling colors and emphasize their plight. 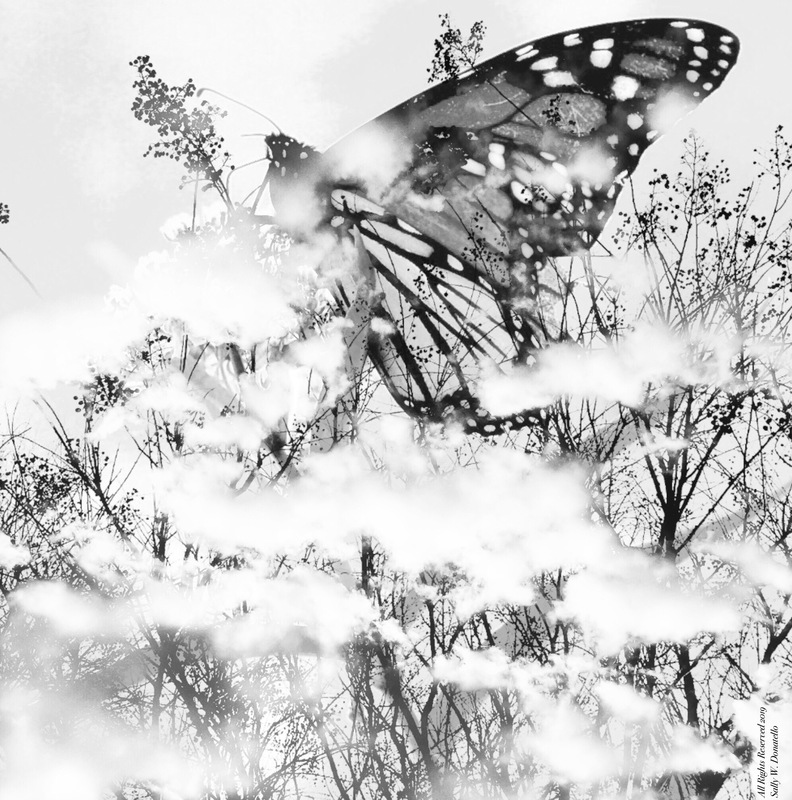 The photomontage is a façade of clouds that mask the single monarch and blur its continuance. But it has courage and tenacity to continue the good fight, which is exactly what we must do: bring back the lost populations of monarchs and, in turn, shore the health of the planet. Each spring the air changes its perfume, calling me to spend more and more time cultivating the earth and my spirit. Thoughts about the return of nectar to the garden triggers scenarios of what the season will unveil and reveal. Today in the midst of winter it is blustery and bitter as arctic air builds volume with a vengeance, so it is easy to daydream about spring’s arrival with all its jewels and warmth. I pledge to increase the butterfly milkweed that by mid and late summer will be announcing their floral readiness for the monarch’s stages of the life cycle. Still, I cannot help but tie humanity’s survival to this majestic and fragile creature, and hope that every small effort adds up to saving them. That every small effort erases their (and our) plight to survive. **** Asclepias tuberosa is a species of milkweed native to eastern North America. It’s the variety that I plant, and is necessary for the monarch’s life cycle. Jamie M. Allen and Sarah Anne McNear are the authors of The Photographer in the Garden (2018), which according to an advertisement in Aperture magazine, “explores our unique relationship with nature through the garden. From famous locations, such as Versailles, to the simplest home vegetable gardens, from worlds imagined by artists to vintage family snapshots, The Photographer in the Garden traces the garden’s rich history in photography and delights readers with spectacular photographs. The book explores gardens from many angles: the symbolism of plants and flowers, how humans cultivate the landscapes that surround them, the change of the seasons, and the gardener at work. An informative essay from curator Allen and picture-commentaries by McNear broaden our understanding of photography and how it has been used to record the glory of the garden. The book features photographers from all eras.” It’s an inspirational compilation, one worth your exploration. This entry was posted in Black-and-White Photography, Digital Art, Mobile Photography, Nature, Nature Photography, Photography, Photomontage, Writing and tagged Black-and-White Photography, Digital Art, Monarch Butterfly, Nature, Nature Photography, Photograph, Writing. Bookmark the permalink. Amy, that makes my day even sunnier than its is. It’s great that your area contributes to their needs. Oh so very lovely, both words and pictures! Thank you. Thank you for your response and visit. I appreciate your comment. Speaking of flowers and gardens, I used to assume that the gardenia got its name from the word garden. Turns out, though, that the flower was named after Alexander Garden, a Scottish physician, botanist and zoologist. Steve, I do enjoy your love of words. We share that passion. Lovely to hear from you. Maybe you can try some milkweed, especially the perennial species. Pens & Prose Devine today, Sally. Your photomontage does an effective job of bring to light the plight of the butterflies. Allan, I’m humbled. Thank you for your response. Such a beautiful powerful post Sally! Nicole, you brought a ray of happiness to my day. Thanks. A lovely ethereal artwork, Sally. Every small effort does add up. People forget that and that’s part of why problems develop. Absolutely, I was thinking about your point this morning. We must all do our share, and hopefully the small increments make a difference locally. Lovely to hear from you. What a lovely magical image. Suzanne, lovely to hear from you. Thanks. A lovely tribute to one of nature’s beauties. Such a delicate, yet vibrant insect. Patti, I appreciate you comment. They are incredible examples of nature’s wonders. Thanks so much. You’re welcome and have a light-filled week, Sally. With good fortune the sun is blazing today. Still, the temps are blistery. But then you live in the windy city, right. Does that mean that you will be on a pilgrimage in search of a new home? Or do you have a destination? Sounds intriguing. A combination of both. We’ve spent 14 months so far traveling and expect to continue through 2019 and maybe into 2020. Along the way, we’re figuring out our options. It also depends on our son who is now in Vancouver. But mostly, we’re exploring! Exciting, exciting, exciting. What’s been the biggest surprise as you’ve navigated the road? Great question. There have been several surprises. One of them is how so many countries are relying on tourism for a good portion of their revenue and how all this “traffic” is damaging the local cultures. Absolutely, it’s scary. Ecotourism is on the rise. But what does that do to the environment that it promotes? Beautiful, gentle image Sally and important words as always. I haven’t seen many Monarchs this season yet, but am hopeful. There are many people in my community planting milkweed, and actively trying to provide enough food the the caterpillars. Su, that’s good news. It’s important that people are aware of what role they can play to help return the populations. Thanks. Indeed, their presence are such strong memories, and one that I hope will be more prevalent soon. Thanks.